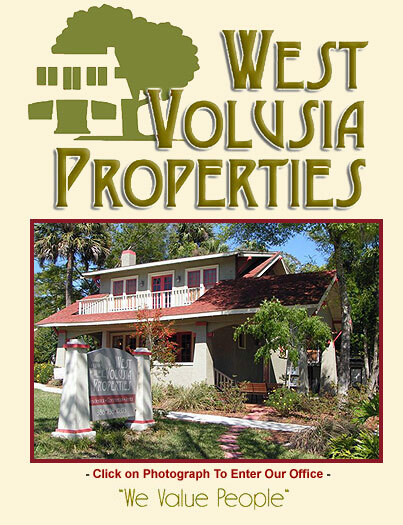 West Volusia Properties a Genuine Pleasure! West Volusia Properties, a Real Estate Company with Heart, is here to help! Whether you're looking for a foreclosure or short sale, a condo, single family residential home, vacant land, beach front property, river front, rental, commercial, or investment property, give us a call! Serving Central Florida - Volusia County, Lake County, Seminole County, Orange County, Putnum County - DeLand, Ormond Beach, Daytona Beach, New Smyrna Beach, Port Orange, Oak Hill, Orange City, DeLeon Springs, DeBary, Deltona, Lake Helen, Orlando, Winter Park, Sanford, Crescent City, Tavares and beyond! Stetson University - Let us find you a house whether for staff, professor, or student! Waterfront Property - St. Johns River, Lake Winnemissette, Lake George, or the Atlantic Ocean. Central Florida is Paradise! From Ormond Beach and Daytona Beach along the coast south to New Smyrna Beach and Ponce Inlet and west through DeLand to the northerly meandering St. Johns River, Volusia County exudes natural beauty. The area's spring fed lakes and pristine clear water springs bubbling up from the Florida aquifer make Volusia County and Central Florida a glorious place to escape crowds, cars, and crime. No wonder everyone wants to move here. Learn more about DeLand and Volusia's other cities by visiting the links made available on this website. But for that "Personal Touch" just call Maggi at 386.717.9991. Her motto, "Real Estate With A Personal Touch," means you will receive the best attention possible! Maggi Hall Is the Name YOU Can TRUST!